The Boston school system has agreed to revamp its school suspension practices as part of a settlement of a case alleging that school employees illegally suspended students and in some cases threatened to notify police or child welfare investigators if parents could not immediately pick up misbehaving children. Among the changes: The system will end the practice of suspending kindergartners, first-graders, and second-graders, and stop suspending older students for minor offenses. The lawsuit, which was filed last year in Suffolk Superior Court, centered on three students of color who were allegedly involved in relatively minor discipline incidents that the schools nevertheless treated as urgent crises. The settlement comes as education and social justice advocates in Massachusetts and across the nation have been raising concerns that overreliance on suspensions is potentially putting too many students on a path to the criminal justice system. Suspensions can cause students to fall behind academically. It also provides them with unsupervised time when they can get in trouble, fueling what advocates contend is a school-to-prison pipeline that disproportionately affects students of color and those with disabilities, who experience higher rates of suspensions than their peers. “We need to solve this problem and not just remove kids from school,” said Elizabeth McIntyre, an attorney for Greater Boston Legal Services, which represented the parents as part of its School to Prison Pipeline Intervention Project. According to the lawsuit, the Ellison/Parks Early Education Center in Mattapan demanded that one mother drop everything and pick up her 8-year-old daughter because the girl had wandered out of her classroom and into the guidance office four times that day. In another instance, the McKinley South End Academy canceled bus transportation for one boy without informing his parents that he had been suspended and then repeatedly refused to provide his mother with information about the discipline. 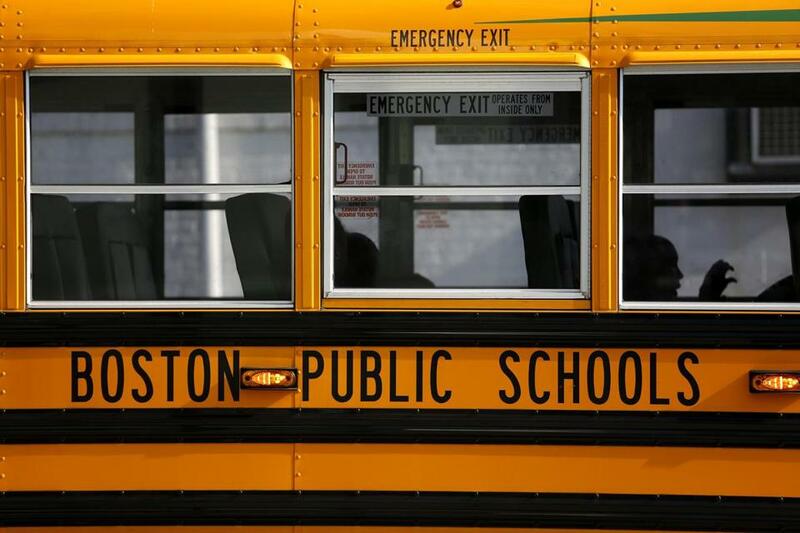 And TechBoston Academy in Dorchester insisted that a mother immediately take her 12-year-old son home without initially offering an explanation. It was later revealed that the boy had had an argument with another classmate during lunch. In each case, the schools failed to follow state law and the school system’s own discipline policies, which require schools to notify parents and hold a hearing before suspending a student. Greater Boston Legal Services said the incidents are endemic of a larger problem in which Boston schools ignore state law and school system policies, while often threatening families with retaliation if they cannot immediately come to school because they are at work, caring for other children, lack transportation, or attending school themselves. “These threats have included: telling parents the school will file a report of alleged child neglect with the state Department of Children and Families, calling the police on their young children, unilaterally putting a child in an ambulance and sending them to a hospital emergency room — regardless of a parent’s ability to meet their child at the hospital — or requiring the child to stay out of the classroom all day,” the lawsuit said. The lawsuit also contends schools frequently do not officially record suspensions. The Boston school system admitted to no wrongdoing in the settlement but agreed to halt unlawful suspensions. The agreement restricts suspensions to cases involving physical assaults, sexual misconduct, repeated bullying, civil rights violations, and possession of dangerous weapons or controlled substances. Other measures agreed to include streamlining the process by which schools record suspensions and training school staff on a variety of issues, including alternative approaches to school discipline and proper procedures for reporting incidents to child welfare investigators. Laura Perille, interim superintendent, touted steps the school system has taken in recent years to reduce suspensions, while saying that some measures in the agreement will aid in that effort. “With the finalization of this agreement, BPS will be providing support to school staff to ensure full implementation of disciplinary protocols that are consistent with established best practices, legal obligations, and the best interests of all BPS students,” Perille said. According to data the school system released Friday, its overall suspension rate dropped from 4.8 percent during the 2014-15 school year to 2.1 percent last year. Suspension rates during that time declined for black students from 7.6 percent to 3.2 percent and for Latino students from 4.4 percent to 2 percent. The data also indicated that 229 kindergartners, first-graders, and second-graders were suspended last school year. School systems across Massachusetts have been under pressure from the state to reduce suspension rates, since the implementation of a state law in 2014 required schools to use suspensions as a last resort. Although suspension rates have declined statewide, questions have persisted about whether some schools are suspending students off the books or recording suspensions as routine absences. For instance in 2015, a Globe reporter spotted a sign on the front door at Brighton High School warning tardy students they would not be allowed inside after 9 a.m. unless they had a note from a doctor or the court. Parents who filed the lawsuit said Friday they hoped the agreement will result in students missing fewer days of classes and that procedures will be followed, including providing students and families their due-process rights for hearings when a suspension is recommended along with necessary information. “I think everybody’s priority is to have these kids graduate and be successful,” said Melissa Jones, the mother of the girl who was suspended after wandering out of her classroom. Irlanda Montrod, the mother of the boy who got into an argument with another student at lunch, said she did not understand why the other boy was not suspended and that she had to haggle with her son’s school for days to get paperwork outlining the reason for the suspension. Her son, who remains at the school, is doing well this year, earning As and Bs. “Kids need to be in school,” she said.